Aside from the iPhone 8 and the Galaxy Note 8, the tech world has another rather anticipated pair of smartphones in its sights - the Pixel 2 and the Pixel XL2, Google's anticipated follow-ups of last year's generally well-accepted consumer-friendly smartphones. As such, the second-gen Pixels are already garnering lots of attention under the form of rumors, gossip, and hearsay seeping through the grapevine, available for just about anyone mildly interested in Google's device effort to reach out and grab. We already seem to know a whole lot about the next Pixel phones and we can make educated guesses about whatever we know nothing about. With that in mind, let's explore some of the biggest expected highlight features of the upcoming kings of Android hill. Google is no stranger to 6-inch devices (looking at you, Nexus 6), but the upcoming Pixel XL 2 will likely be a much more attractive ordeal than the 2014 Nexus device. Codenamed Taimen, the large Pixel is largely expected to make use of an efficient design with really slim bezels just as it's trendy right now. 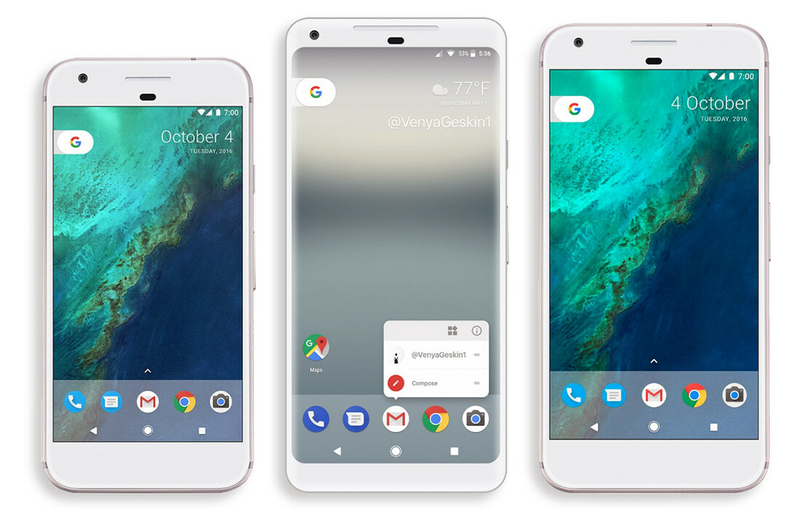 As per the rumors, the Google Pixel XL 2 with its 6-inch display will be ever-so-slightly taller and wider than the current Google Pixel. Yeah, the small one! As far as build materials go, metal and glass would be more than a safe bet; we also expect Google to retain the overall aesthetics of the Pixel lineup - all metal body with a glass panel at the top rear. Google could be looking forward to joining Samsung and LG which were the pioneering parties that introduced 2:1 displays to the public. The larger Pixel will reportedly boast such a display that will match with its bezel-busting design. The more manufacturers jump on that bandwagon, the sooner we will get more media content suitable for the new viewing format. Taking a page from HTC's book, Google is said to be entertaining the idea of throwing in a squeezable, touch-sensitive frame on the phone. Just like on the U11, you will likely be able to squeeze the phone with your palm, which will trigger a predefined action. While this novel and rather exotic feature is yet to prove itself as a useful addition to Android, employing it on Google's flagship phones this autumn could mean an exposure to a wider audience and further adoption. With high-profile devices like the Pixel 2 and Pixel XL 2, high-end specs are a given. Having a top-end chipset, like the Snapdragon 835 or a supercharged variation of that one, at least 4 gigs of RAM, fast internal storage, and superb camera package will make sure that the second-gen Pixels will continue to be among the best Android devices you can get. Do you remember that the Google Assistant was once a Pixel-exclusive ordeal, and so was the Pixel launcher? That's one way of Google differentiating its Pixels from all the other smartphones that choose to use stock Android, and we wouldn't be surprised at all if the Pixel 2 and Pixel XL 2 get a few of these on their own. According to David Ruddock from Android Police, Google's is considering intriguing new color options for its upcoming second generation of Pixel phones. No idea what these could be or if they are going to make it to mass production. Last year's Pixel and Pixel XL arrived in Quite Black, Very Silver, and Really Blue colors, and we wouldn't rule out the possibility that El Goog will once again go for tongue-in-cheek color names. Of course, you won't be able to get all the aforementioned goodies on the cheap. Premium has a certain price tag for it, and if we believe the rumors out there, the next crop of Google's smartphones is about to cost more. No idea how much more expensive they will be, but it is a safe bet to assume that the larger Pixel will command a way higher price tag than the regular one due to its trendier design and exclusive software/hardware features. Our descriptive rumor review with all there is to know about the Pixels will keep you in the loop, so feel free to check it our right below! Sqqueeeze me tight guugule!!! But seriously if this were htc or other underdog brands, everybody would be criticizing the squeeze feature as a gimmick (or just about any feature even) but when its apple, google, microsoft, nokia, and samsung etc people would be all over it like its some sort of sliced bread. Keep up the good work htc and keep innovating. I stillt remember stereo boom sound speakers and dual ultra pixel cameras like its yesterday. You are stupid. No question. "While this novel and rather exotic feature is yet to prove itself as a useful addition to Android" Hasnt caught on. But how is it NOT useful to have an added way of triggering an option, that costs the end user nothing? It's the same as an extra button that you can remap. Like the bixby button should be. I prefer the extra button to the squeezable frame tbh. There you can tap, hold and double tap for different functions/appr without any danger of the phone falling from your grasp and without feeling weird. Higher price tag? I guess the existing phone isn't expensive enough? I don't like this new look of phones resembling telephone poles. I would rather a wider phone. I'm 5'2", petite woman, not large hands and my Nexus 6P still feels comfortable in the hand. I held the S8, it's too skinny. That said, I'm buying the XL2 if the speaker and camera are excellent. They will be exactly that... Excellent. Especially the camera. My money is ready for 2 pixel xl.